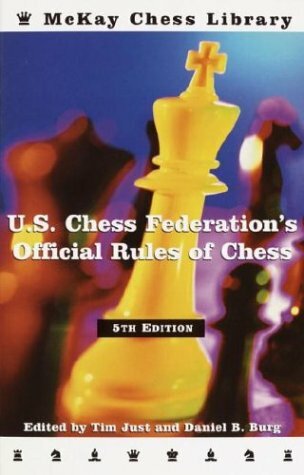 12.14.06 A small but significant change in one of the United States Chess Federation's Official Rules of Chess will take effect on January 1, 2007. The rule, 15A. Manner of keeping score, will be altered slightly to require the player to first make their move on the board and only then record it on the scoresheet. As the rule currently stands, the player can record the move first then execute the move on the board. In fact, many chess coaches and trainers council their students to do just that--record the move, look at the board with fresh eyes and then make the move. This rule change is due, in large part, to the advent of electronic scoresheets (see new rule 43) such as the MonRoi Personal Chess Manager. Recording a move on an electronic scoresheet would allow the player to actually view the position one move hence and increase the player's calculation horizon. New Rule 15 A. Manner of Keeping Score. In the course of play each player is required to record the game (both the player's and the opponent's moves), move after move, as clearly and legibly as possible, on the scoresheet prescribed for the competition. Algebraic notation is standard, but descriptive or computer notation is permitted. The player must first make the move, and then record it on the scoresheet. A scoresheet is any piece of paper, electronic, or mechanical recording device that allows a player to comply with rule 15 A. Electronic scoresheets are subject to certification guidelines as published by the USCF. An electronic scoresheet not so certified is not considered standard and may only be used at the discretion of the tournament director. Often a pre-printed scoresheet has spaces indicating players’Äô names, event, other game related information, spaces for the recording of the moves, result and the signatures of the players. If a scoresheet is provided by the event, then that scoresheet is the standard used for that event. If a scoresheet is not provided by the event, then an alternate scoresheet is allowed provided it meets the rules established in 15A. If an event, even when it provides scoresheets, does not require that a copy of the score be submitted, then the TD may allow the use of an alternate scoresheet. If an event requires that a copy of the score to be submitted, the TD may require the use of the scoresheet provided, or may accept an alternate method of providing that score. A TD may require the use of the provided scoresheet, or may allow non-standard scoresheets to be used even if one is provided. While this rule brings the USCF in alignment with FIDE procedures and soothes many of the fears surrounding electronic scoresheets (see new rule 43), it is a huge change for many players. TDs are advised to first (and possibly second and third) issue warnings to players that do not comply with this revised rule before enforcing any time penalties (1C2a. prescribes adding two minutes to the opponent’Äôs unused time). TDs are also encouraged to announce this rule change at the start of the tournament. Some TDs may take the middle road in enforcing this rule by announcing that it applies to electronic scoresheets only. TDs of local and club tournaments that are attended by players without electronic scoresheets, or that rarely attend any other outside tournaments, can announce that they are going to enforce old rule 15A (page 55 in the 5th edition of the rules), allowing the move to be written on the scoresheet first; however, TDs need to be aware that both of these announced variations do little to prepare players for participation in events that enforce the "make your move first" rule. Tournament directors are advised to be flexible on the above. Many players have their own scoresheet in the form of notebooks or recording devices, and prefer to keep their games in an orderly fashion within that book. If a player can provide a copy of the score from their notebook, or a printout or downloaded from the electronic scoresheet, this is acceptable. You have the score and the result of the game. Hmm... Interesting comment, Fred, re: The USCF's new move- recording rule change. IMHO, people competing in serious tournament play who utilize electronic recording devices which feature MORE than simple move recording software could conceivably be tempted to 'push the envelope'. It would easily be possible, it seems to me, for tech-savy players to surreptitiously imbed move- analysing computing software within MonRoi-like electronic recording-devices, for example. Thus I view the rule change as a good prophylactic idea, and I don't see how it 'hurts' anything - Just as I don't see the harm in keeping the rules the way they were, if -say- electronic recording devices could somehow be certified as incapable of doing anything more than recording and printing out moves, and perhaps ONLY displaying the position of the pieces as they were both BEFORE - and - AFTER move recording. Thanks again Dan and everyone for a great website and your contribution to the future of a very beneficial and respected element of our global society - the inimitable 'game' of chess!! I THINK THE RULE IS MOOT. WHAT DIFFERENCE DOES IT REALLY MAKE AS LONG AS IT IS EVENTUALLY RECORDED ON THE SCORE SHEET. (BEFORE OR AFTER THE MOVE) THIS TYPE OF NONSENSE IS PROBABLY WHY I PLAY ON LINE NOW INSTEAD OF TOURNAMENT PLAY. ON LINE (WWW.POGO.COM) I CAN PLAY PERSONS FROM ALL OVER THE WORLD AND WIN AND LOSE AND I DO.I NOW HAVE FRIENDS IN 20 COUNTRIES THAT I CAN PLAY AGAINST ANY TIME I WISH.